France was the fourth country to join the so-called “Nuclear Club,” and at the height of the Cold War maintained its own nuclear triad of land-based missiles, nuclear-armed bombers and ballistic missile submarines. Today, France’s sea-based nuclear deterrent is the home of most of its nuclear arsenal, with four nuclear-powered ballistic missile submarines, of French design and construction, providing constant assurance against surprise nuclear attack. France’s nuclear weapons arsenal began in earnest on February 13th, 1960, with the country’s first nuclear weapons test. The test, code-named “Gerboise Bleue” (Blue Desert Rat) confirmed that France had the know-how to build its own weapons. It also confirmed that France had the nuclear know-how to part ways with the United States and NATO and chart its own course versus the Soviet Union. France began working on its own naval nuclear propulsion program in 1955, under what was known as Project Coelacanth. The first effort to build a nuclear-powered submarine, Q.244, was to be the first of five nuclear ballistic missile submarines. The effort to develop Q.244 was a failure, due to the inability of nuclear engineers to sufficiently miniaturize the reactor, and the submarine was cancelled in 1959. A subsequent project to develop a land-based reactor, PAT 1, was a success and led to development of Q.252, which became the submarine Le Redoutable. At the same time, France’s defense industry was working diligently to produce a submarine-launched ballistic missile. The result was the M1 MSBS, or Mer-Sol Balistique Stratégique (Sea-Ground Strategic Ballistic Missile). The M1 was a two stage rocket with a 500 kiloton warhead and a range of 1,553 miles. This was sufficient range for a French ballistic missile submarine in the Bay of Biscay to strike Moscow. France’s first generation missile submarines, the five submarines of the Le Redoutable class and the single L’Inflexible submarine, were all built at the Cherbourg shipyards and completed between 1971 and 1980. The cancellation of Q.244 may have been fortuitous, as it allowed the United States to make pioneer engineering decision in nuclear ballistic submarine design, something also seen in the Soviet Union’s first generation Yankee-class ballistic missile submarine. The overall layout of the Redoutable class was very similar to the U.S. Navy’s second generation Lafayette-class ballistic missile submarines, with fin-mounted hydroplanes and sixteen missile silos in two rows of eight directly behind the fin. The first two submarines, Le Redoutable and Le Terrible, carried the M-1 missile, while the third, Le Foudroyant, carried the improved M-2 missile with a longer 1,841 mile range. The next two submarines, L’Indomptable and Le Tonnant had a mix of M-2 missiles and the new M-20, which had the same range but a gigantic 1 megaton thermonuclear warhead. The last submarine, L’Inflexible, carried missiles of a completely new design. Designated M4, the missiles had a 2,474 mile range, allowing them to strike as far east as Kazan. At the height of France’s nuclear weapons arsenal, 87 percent of France’s nuclear arsenal was in submarines. France’s nuclear submarine fleet, the Force Océanique Stratégique (FOST), was based at Ile Longue in Brest, and FOST submarines were sent on two month patrols off the coast of France and Portugal. Three submarines were to be at sea at any one time, with a fourth also ready to go to sea. Starting in the mid 1980s, all submarines except for Le Terrible were outfitted with improved M-4A and then M-4B missiles with ranges of up to 3,720 miles and multiple independently targetable reentry vehicles, allowing each missile to carry six 150 kiloton warheads. The MIRVing of the M4 increased the firepower of each submarine sixfold. In addition to their nuclear firepower, the Redoutable class submarines had four 533-millimeter torpedo tubes for self-defense, capable of launching the L5 Mod. 3 anti-submarine torpedo and the F 17 dual-purpose torpedo. They could also launch the SM 39 Exocet anti-ship cruise missile, but the primary mission of ballistic missile submarines is always to avoid detection until their nuclear missiles are needed. 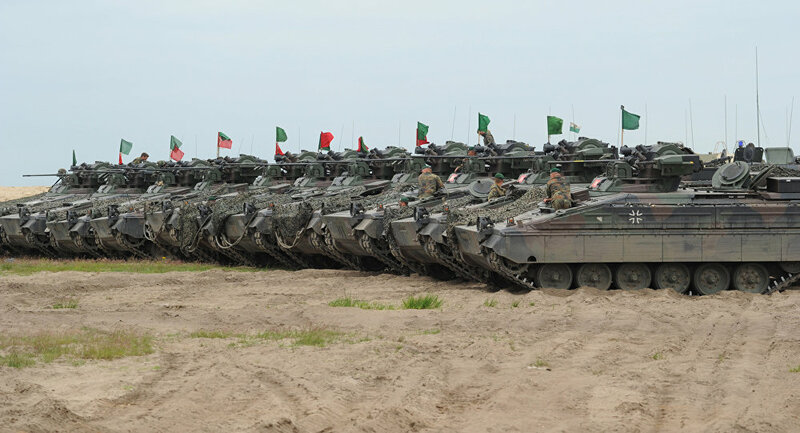 Occasional incidents between Russian and NATO military forces are fairly possible, and some of them may be intentionally provoked, Russian International Affairs Council expert Prokhor Tebin told Sputnik. “Our relations with the US and NATO will certainly remain tense and I do not expect any reset like the one we had after the 2008 conflict in Georgia happening any time soon. Limited local-scale military incidents between Russia, the US and NATO, or its individual members, with real fighting and losses,” Tebin said while presenting a report in Euro-Atlantic stability at the recent meeting of the Valdai Discussions Club. “Moreover, some of these incidents could be intentional,” he added. Prokhor Tebin highlights the November 2016 incident when Turkey shot down a Russian warplane in Syria as an example of such a conflict. He proposed closer dialogue between politicians, diplomats, experts and military men on both sides and the need “to outline their priorities and national interests they will not budge on and the “red lines” they’re not willing to let each other cross. US and Canada Institute’s deputy director Pavel Zolotarev likewise ruled out the possibility of Russia and the West actually coming to blows. “Even if we imagine that [the US] goes to war with Russia, it would have to enlist the help of its NATO allies in Europe, which is unrealistic,” Zolotarev said. He mentioned how reluctantly America’s fellow NATO members in Europe supported Washington’s military operations in Iraq and Afghanistan. “Where was NATO when the US was preparing to invade [Iraq]? The Americans were forced to cobble together the so-called ‘Coalition of the Unwilling’. In Afghanistan Russia acted as a partner, but NATO didn’t,” he added. Zolotarev believes that aside from the post-Soviet territory, there is really nothing Russia and NATO can’t agree on. NATO-Russia relations have been complicated over the past few years, as NATO has set a sustainable course for the alliance’s expansion by engaging Eastern European states since 2014. NATO justified its eastward expansion as a response to Russia’s alleged meddling in the Ukrainian conflict. Moscow has repeatedly and vehemently refuted these allegations. Several American cities, including New York, San Francisco, and Honolulu, have response plans for terrorist attacks, including so-called “dirty bombs” containing radioactive material. But few have publicized plans to deal with a real nuclear explosion. “Mom, I know you care about me,” she says. “When I was five, you taught me how to stop, drop, and roll … But what if something bigger happens?” The video then flashes to the girl walking down empty streets alone. The scenario assumes a terrorist-caused nuclear blast of about 10 kilotons’ worth of TNT or less. Few people would survive within the immediate damage zone, which may extend up to one or two miles wide, but those outside would have a chance. Buddemeier said you’d have about 15 minutes – maybe a little bit longer, depending on how far away you are from the blast site – to get to the center of a building to avoid devastating exposure to radioactive fallout. Going below-ground is even better. “Stay in, 12 to 24 hours, and tune in – try to use whatever communication tools you have. We’re getting better about being able to broadcast messages to cell phones, certainly the hand-cranked radio is a good idea – your car radio, if you’re in a parking garage with your car,” he said. Buddemeier adds, however, that you shouldn’t try to drive away or stay in your car for very long, because it can’t really protect you. Today’s vehicles are made of glass and very light metals, and offer almost no shielding from damaging radiation. “All of those hundreds of thousands of people could prevent that exposure that would make them sick by sheltering. So, this has a huge impact: Knowing what to do after an event like this can literally save hundreds of thousands of people from radiation illness or fatalities,” he said. 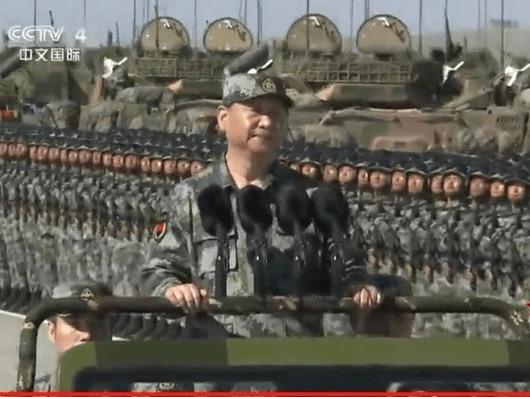 BEIJING: Chinese military today showcased five models of its homemade conventional and nuclear missiles in a massive military parade, marking the 2.3-million strong People’s Liberation Army’s 90th founding anniversary. The models include the Dongfeng-26 ballistic missile, which can be fired at short notice and fitted with a nuclear warhead, the Dongfeng-21D land-based anti-ship ballistic missile described as a “carrier killer” and the Dongfeng-16G conventional missile designed for precision strikes against key enemy targets. Also on display were two types of solid-fuel inter- continental strategic nuclear missiles, which rumbled on top of long-bed missile launchers, state-run Xinhua news agency reported. The equipment and soldiers driving the mobile launch vehicles came from the PLA‘s Rocket Force, which was established in December 2015 as part of the PLA’s extensive military structural reform. The predecessor of Rocket Force, the Second Artillery Force, was founded on July 1, 1966. China’s latest J-20 stealth fighters made their parade debut in north part. Three J-20 jets led an echelon formation consisting of 15 fighter aircraft which roared over the Zhurihe military training base in Inner Mongolia Autonomous Region during the country’s first-ever Army Day parade. The J-20 is China’s indigenous fourth-generation medium and long-range fighter jet. It made its maiden flight in 2011 and was first publicly displayed at the 11th Airshow China in Zhuhai, Guangdong Province, in November last year. “The enlisting of fourth-generation jets will bring fundamental changes to the rules of the game in air battlefield,” said Wang Mingzhi, a professor with the PLA Air Force Command College. “It will also draw the curtain on transformation in the PLA Air Force,” Wang said. Besides J-20, J-16 fighters and Y-20 heavy transport aircraft were also among the new aircraft making parade debuts today. The J-16 is a two-seat, dual-engine multi-role fighter with beyond-visual-range air-to-air and air-to-ship strike capabilities. The Y-20 plane with a maximum take-off weight of about 200 tonnes, is designed to carry cargo and personnel over long distances in complicated meteorological conditions. It officially entered military service in July, 2016. The PLA was founded on August 1, 1927 when the ruling Communist Party of China under the leadership of Mao Zedong carried on with his national liberation movement. The parade was held in the backdrop of over month-long standoff between Indian and Chinese troops at Doklam in Sikkim section. Besides Doklam, China is also concerned by the situation in North Korea and the deployment of Terminal High Altitude Area Defence (THAAD) missile by the US in South Korea much to the opposition of the Beijing. Russian President Vladimir Putin has dismissed the idea that the U.S. would claim victory in a conflict with Russia, noting that “nobody would survive” such a clash. Speaking to U.S. movie director Oliver Stone for The Putin Interviews, a four-part series on Showtime, Putin shared a negative view of U.S. military action and its NATO alliance. Russian officials frequently claim that the U.S. commands European allegiance through NATO, despite the alliance arguing that participation in the alliance is voluntary and that allies merely agree to broad military cooperation upon entry, rather than to specific deployment or combat obligations. Troubled by Moscow’s annexation of Crimea in 2014, NATO has reoriented resources to defend allies near Russia. The Kremlin has vowed to respond with its own deployments and argued the move is aggressive. Poland and Romania have claimed they volunteered to host elements of a U.S. missile shield—but speaking to Stone, Putin says this is just another example of U.S. dictated policy. In 2015, the deputy head of Russia’s Security Council Yevgeny Lukyanov warned that countries that accept the U.S. missile shield system “ automatically become targets ” for Russia. “Romania cannot be intimidated by threats! The Missile Defense System is fundamental for the national and regional security,” Romania’s then Prime Minister Victor Ponta said in response. Iraq and Iran signed an agreement on Sunday to boost military cooperation days after the US imposed new sanctions against Tehran for its “malign” activity in the region. The agreement to help “combat terrorism” was signed a day after the Iraqi prime minister Haider Al Abadi said Shiite militias backed by Iran would remain an integral part of the state. Iranian military advisers have played a key role in the campaign to drive ISIL from territory seized by the extremist group in 2014 and the militias, known as Hashed Al Shaabi, have also fought against the extremists along with Iraq’s regular military and police. But the militias have been accused of abuses against Sunni populations in areas recaptured by government forces and there are fears over their future role in the country. The agreement between Iran and Iraq, which extends “cooperation and exchanging experiences in fighting terrorism” was signed in Tehran by the Iranian defence minister Hossein Dehghan and his Iraqi counterpart, Erfan Al Hiyali. The agreement also covered border security, logistics and training, the Iranian official news agency IRNA reported. Since the 2003 US-led invasion of Iraq, Iran’s influence in the country has increased, empowering Shiite leaders and leaving Sunni populations neglected and resentful of the central government, which contributed to the rise of ISIL. With the extremists defeated in Mosul, the last major city under its control, many Sunnis are fearful of a sectarian backlash as the country tries to rebuild. The role of the Hashed Al Shaabi in Iraq has been an issue of widespread contention and will be a key issue in elections next year. The government passed a bill in November that made the Hashed a legitimate entity of Iraq’s security forces and on Saturday Mr Al Abadi declared after meeting militias commanders that “the forces are an essential and neutral security entity and will remain within the structure of the Iraqi state”. While maintaining that “the state is the main leader” of the security structure in the country, he said the Hashed “is a neutral security establishment, and it is here to stay”. “It is our duty to protect it, because we are one,” Mr Al Abadi added. The announcement is the clearest sign of support from the prime minister for the Hashed’s continued role in Iraq after ISIL’s defeat. While his predecessor, Nouri Al Malaki, was widely condemned for his sectarian policies, Mr Al Abadi has been more conciliatory. He has condemned sectarian violence carried out by the militias and tried to build ties with Sunni countries in the region. Last month, he travelled to Jeddah and met King Salman after the Saudi foreign minister visited Baghdad in February. But the Hashed endorsement will raise concerns among Sunni leaders in Iraq. The Hashed are an amalgamation of various subgroups with allegiances to Iran’s supreme leader Ayatollah Ali Khamenei and Iraq’s top Shiite clerics Ali Al Sistani and Muqtada Al Sadr, according to a report on the militias by the Carnegie Middle East Center. “Some subgroups have assumed political roles and will seek to leverage their roles in combatting ISIL to win votes in Iraq’s 2018 elections,” said the report. For militia members, the legitimacy of their struggle against ISIL is a direct result of a fatwa issued by Ali Al Sistani in response to the fall of Mosul in 2014 in which he called the fight a “sacred defence”. “As of November 2016 and the passing of the Hashed Al Shaabi law, the Hashed has become a formally institutionalised part of Iraq’s security apparatus tied to the office of the commander-in-chief,” said Fanar Haddad, senior research fellow in the National University of Singapore. “However, unlike other security units, disbanding the Hashed would not be a straightforward administrative procedure given their immense popularity and legitimacy amongst many Iraqis and given the Hashed’s powerful backers in Iraq and Iran”. The Hashed’s role in defeating ISIL has also given them support from other sections of Iraq and not just Shiites. “The fact is that the Hashed will be a permanent feature of Iraq’s social, political and military landscapes for the foreseeable future,” Mr Haddad added. Samajwadi Party MP Mulayam Singh Yadav on Wednesday claimed that China has installed the nuclear bomb on Pakistan soil and is fully prepared to attack India. “Today, India has immense threat from China. China is conspiring against India, taking Pakistan under its fold. I have been informed that China has installed nuclear bomb on Pakistani soil. China has prepared fully to attack India,” Yadav said in the Lok Sabha. On the ongoing standoff between China and India at Doklam, Yadav said that it is India’s responsibility to protect Bhutan and Sikkim from foreign incursions. “Protecting Bhutam and Sikkim is our responsibility. China is our enemy, not Pakistan,” he said. On Tuesday, Foreign Secretary Jaishankar informed a parliamentary committee that China was articulating its position more aggressively, unlike in the past. In a detailed presentation to the committee members, Jaishankar stressed that the standoff will be resolved diplomatically. She also suggested that China, pursuing an aggressive foreign policy, must adhere to international norms amid Sino-Indian border standoff. “The first shipment of uranium under the commercial arrangement is on its own way to India. The parliamentary clearance for uranium supplies was approved in Australia.India and Australia have also agreed on nuclear safeguards agreement,” the Minister told a select group of reporters here on Tuesday after her meeting with the PM, Foreign Minister and Defence & Finance Minister. India and Australia signed a civil nuclear pact in 2014 and Canberra has been a supporter of India’s entry into the NSG besides other export control regimes. Besides expansion of defence and security partnership, the ongoing standoff in Dokalam figured high on the agenda of Bishop’s meetings with PM and the two key Ministers. “This is long term dispute. While maritime border disputes should be settled based on UNCLOS, land boundary disputes should be settled peacefully. We don’t want to see an escalation. Any miscalculation could lead to tensions,” Bishop remarked. The visiting Minister was of opinion that China has an increasingly assertive foreign policy and it should adhere to international norms and order. When asked about India’s reluctance to include Australia in the Malabar Naval exercise, the Minister avoided a direct reply and said, “The matter is not upsetting. “There are all indications from the top leadership of US that it is continuing with its pivot to Asia-Pacific. Besides President Donald Trump will attend East Asia Summit,” the Australian Foreign Minister pointed out.